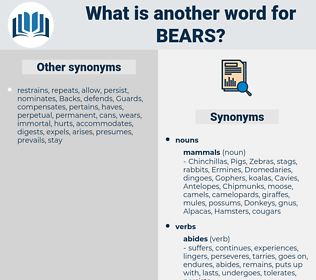 What is another word for Bears? wears, liabilities, beasts, Addresses, creatures, shoulders, implications, habitat, Habitats, Horses, pertains, Undertakings, concerns, species, buggers, consciences, indications, seals, brings, specimens, cattle, floodgates, waybills, birds, individuals, CUBS, commitments, idiots, glasses, gates, chickens, basics, displays, doorsteps, exposures, leads, Pets, clothes, fools, pledges, dogs, Females, feels, east, cows, shall, Persons, stands, rooms, Focuses, focusses, deals, fellows, Les, touches, bugs, doors, hogs, est, avenues, Plants, Has, looks, sounds, is, 's. shouldered, assumed, Served, discharges, fulfilled, shoulders, Took. appears, corroborates, incorporates, reiterates, demonstrates, embraces, participates, wear, resembles, illustrates, acknowledges, commemorates, agrees, belongs, responsible, concentrates, indicates, accountable, behaves, emphasises, burdens, reaffirms, exists, emphasizes, represents, reflects, breeds, translates, assumes, Carrying, testifies, presupposes, generates, contribute, contributes, relates, observes, elaborates, asserts, polar, administers, recognizes, relationships, leverages, suffers, implements, begets, correspond, corresponds, attests, argues, reveals, absorbs, suggests, Recalls, accepts, undertakes, behooves, caters, blames, arises, encompasses, accrues, believes, describes, explains, contemplates, gathers, threatens, correlates, endures, comprises, behoves, encumbers, establishes, declares, exhibits, operates, arrives, constitutes, handles, bracket, Charges, evaluates, attracts, derives, experiences, endorses, includes, engenders, consolidates, embodies, becomes, summarizes, adsorbs, harbours, delivers, strengthens, stresses, regards, wears, support, supports, manages, engages, acquires, considers, befits, catches, Entailed, entails, Exercises, creates, regulates, treats, formulates, proposes, possessed, possesses, relations, showcases, captures, reminds, underlines, shares, alleges, affirms, expresses, governs, features, earns, enshrines, similar, stipulates, Manifests, underscores, deserves, increases, Affects, removes, substitutes, concludes, pursues, relies, incurs, equates, sustains, defrays, save, saves, stimulates, assures, oversees, revolves, contains, proves, OWES, raises, introduces, persists, retains, explores, imposes, influences, resides, adopts, responds, assesses, cares, advocates, hangs, depicts, Amongst, presents, validates, reverts, reinforces, covers, preserves, promotes, confirms, finances, combines, encounters, elucidates, assigns, receives, directs, answers, ratifies, involves, identifies, Faces, impinges, refers, doorways, stretches, confers, consumes, enhances, obliges, determines, highlights, discloses, produces, serves, Guards, transports, Carries, fulfills, requires, performs, proceeds, consists, maintains, envisages, informs, disclaims, depends, announces, conveys, expands, pays, provides, weighs, implies, Addresses, recurs, reaches, examines, speaks, concurs, favours, Leaves, respects, warrants, fulfils, offers, commits, undergoes, devotes, employs, draws, applies, enjoys, boasts, lies, attaches, analyzes, exposes, merits, Strikes, completes, collects, instructs, Drives, impact, IMPACTS, presumes, justifies, happens, shapes, compels, lead, ensures, seems, convenes, specifies, centers, devolves, reads, poses, wields, occupies, demands, tells, interferes, Replies, underpins, reviews, adds, outlines, Watches, occurs, submits, incidence, causes, centres, takes, SITS, shoulders, upholds, store, stores, lays, mirrors, yields, unites, conducts, holds, places, hurts, commands, fails, allows, says, points, accounts, Backs, aims, pertains, Rests, Gives, shows, Dives, prompts, stems, monitors, returns, sees, moves, spawns, turns, curries, load, loads, Comes, concerns, intends, discusses, sends, Denies, Plays, smacks, extends, owns, Deems, casts, ties, lacks, touch, needs, pushes, shifts, brings, hinges, sets, calls, knows, asks, falls, seeks, helps, Maps, means, amounts, fits, drops, matches, suits, keep, keeps, reduces, hits, hosts, displays, wishes, lists, looms, runs, puts, leads, defines, meets, thinks, counts, builds, ai, lags, feels, makes, funds, finds, acts, stands, Focuses, focusses, deals, Does, goes, wants, claims, Les, touches, gets, com, Has, looks, sounds, is, 's. Your night work on one occasion bears the light very well. You are sure, beyond chance of error, that he bears letters to that effect, good Father? 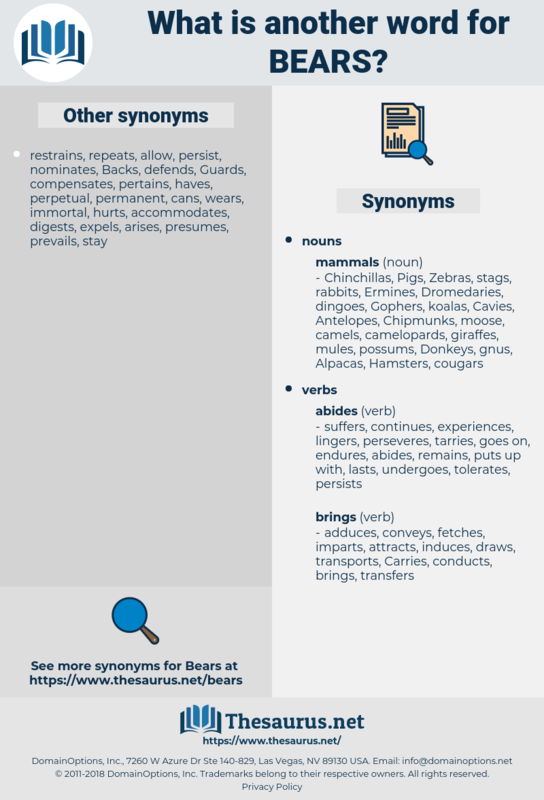 barye, burr, bihari, buyer, bayer, Beira, beaver, behavior, bearer, beria, bra, brahe, bur, brier, briar, briery, berry, burry, beaver away, bower, Brae, biro, brew, buber, bore, brouhaha, bohr, bura, barrier, bewray, bari, bureau, Boer War, bier, beauvoir, brewery, bayberry, brahui, burrow, berra, bihar, brewer, beware, bavaria, brya, barrio, brow, brie, brio, bobber, buffer, boar, breuer, beroe, bowery, beer, briary, barrie, burro, beeper, Byre, br, bwr, borer, bear away, behaviour, before, boer, birr, babar, bury, bare, borrow, by far, boor, bray, barrow, borrower, braw, beery, bar, Bobby Orr.